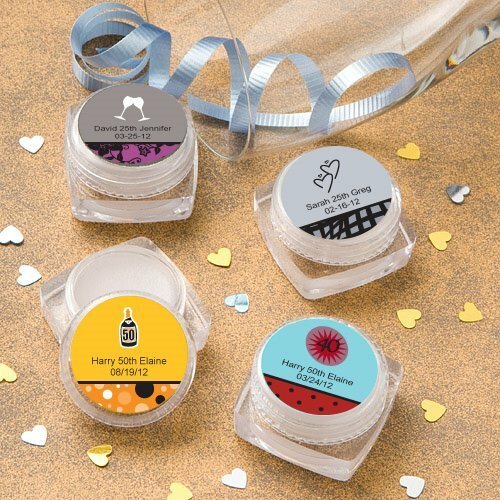 Our lip balm favors make a handy addition to any purse or pocket and the personalized labels make them a special memento to help you celebrate any occasion! You can choose from hundreds of any occasion label designs, but as shown in the photo, these lip balms are great as 25th, 50th or 40th wedding anniversary favors. Each 1.2" round container contains luscious vanilla flavored lip balm inside and is topped with a screw-on lid. Choose from a variety of designs and colors then add 2 lines of custom text for a truly special gift!